With an out-of-town guest, the flurry of activity surrounding buying a house, and a quick trip to Philly last weekend, I haven’t had much time for reading or blogging. And then right before the end of March and the start of my April plan to read all twenty of the Penguin English Journey series I picked up this Wilkie Collins. This is the first Collins I have read since reading The Woman in White (which happened to be my very first Collins and my introduction to his work). The Dead Secret has many of the same qualities as that book but doesn’t come close to being as brilliant. Sure there are secrets and intrigue and unexpected trips hither and yon, and there are definitely moments where you are at the edge of your seat in fear or expectation, but in the end it can only pale in comparison to the 600 plus pages of The Woman in White. In fact at only 359 pages, it practically counts as a short story in the world of Wilkie Collins and his predilection for writing door stops. Like Trollope and Dickens, Collins uses 70 words when seven would do. In fact this is part of their allure for me. The Victorian phrasing and the detailed attention to manners and setting are all part of the charm. Yet unlike The Woman in White, this one really felt Collins was being paid by the word. Lopping off a hundred pages would have made this a better book, but alas would not have made it a Collins. 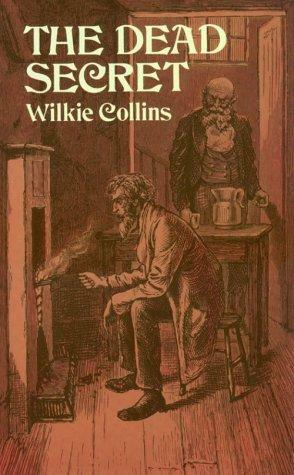 Don’t get me wrong I liked The Dead Secret, but if you haven’t read Wilkie Collins don’t start with this one. And if you have read Wilkie Collins there is no reason not to read this one when you get the chance. Have you read the Moonstone or Armadale yet? I love the Woman in White and the Moonstone, but to me Armadale is my favorite. I would agree with you, I think this is a good book and a must for Wilkie fans but maybe not the best place to start with him. I loved The Woman in White almost as much as The Moonstone. Not quite sure what my next Wilkie Collins book will be, but I'll keep this in mind. Amanda: I haven't read those yet. I am definitely not giving up on Wilkie. Simon S: I think I put him in my comfort read category. The stories aren't comforting, but they are like visiting with really good friends. They make you happy. JoAnn: I am not sure what my next will be either. But I do actually own Hide and Seek and No Name. I will definitely plan to read The Woman in White first. I've had it on my shelf for months and have still not read it! Sounds good. I like your word cloud. It's just not great literature unless somebody faints. I really loved The Woman in White too. Have you read Dan Simmons' DROOD? Wilkie Collins is the narrator, and the book gives you a completely different perspective on his own writing. The book is massive, though, so you'll have to save it for after April. Kathleen: It was my first and got me hooked. Overdue: Lots of fainting in this one. Hannah: The word cloud was my lazy way of not having to describe the plot.